The old part of Copenhagen is surrounded by an old fortification that goes from south to north around the medieval town. In fact both the “lakes” and most of central Copenhagen’s parks are remnants of this old fortification system. In the northern end, not far from the Little Mermaid statue you’ll find Kastellet. This old citadel was built in 1662 and is one of the best preserved in Europe. 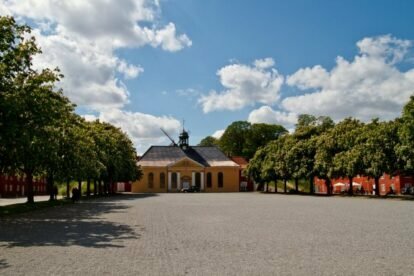 While The Citadel remains an active military area it is open to the public and it’s one of my favorite places in Copenhagen to take a stroll on a sunny autumn day. There is plenty of space to walk around the ramparts overlooking both the sea (the Øresund Strait) and the moats surrounding the citadel. On the citadel grounds there are picturesque old barracks, an old church as well as a windmill and it is fantastic to walk around and just let your mind wander. You’ll truly feel as if you are back in the 17th century. Don’t forget to bring your camera. Within walking distance of the citadel you can find prime Copenhagen touristic spots such as The Little Mermaid, Langelinie Promenade, Gefion fountain and St. Alban’s English Church. All are well worth a visit and can all be done in a few hours.